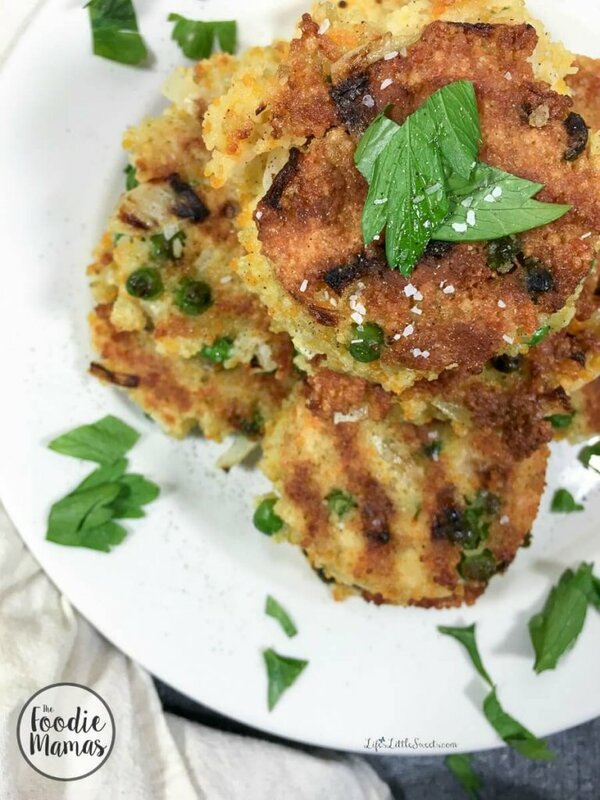 These crispy Couscous Fritters have only 7-8 ingredients and can be made in 30 minutes! 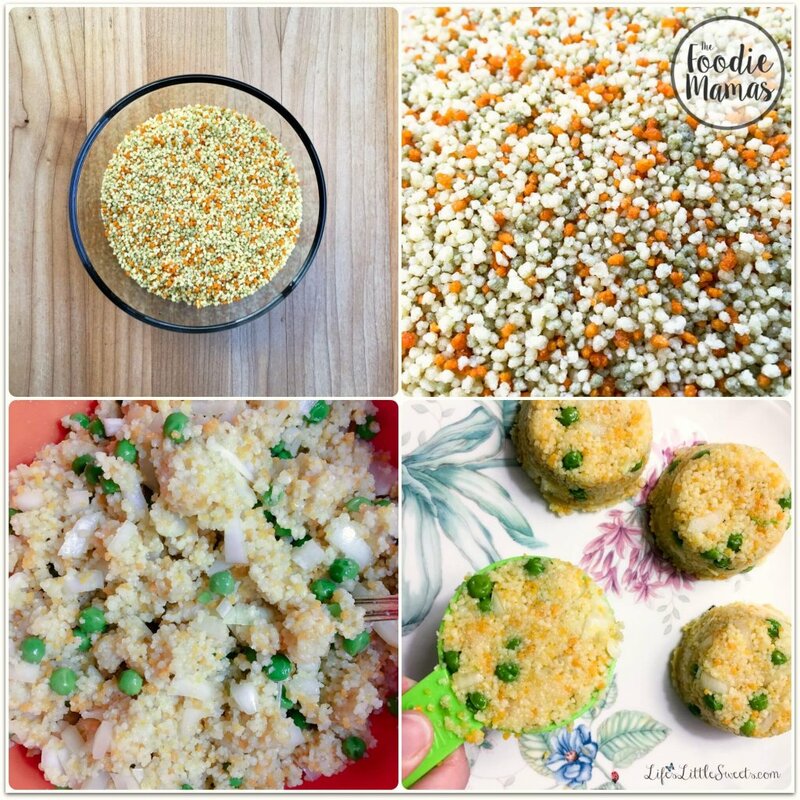 Be sure to check out the other #FoodieMamas couscous recipes below! I love food with texture and crunch. 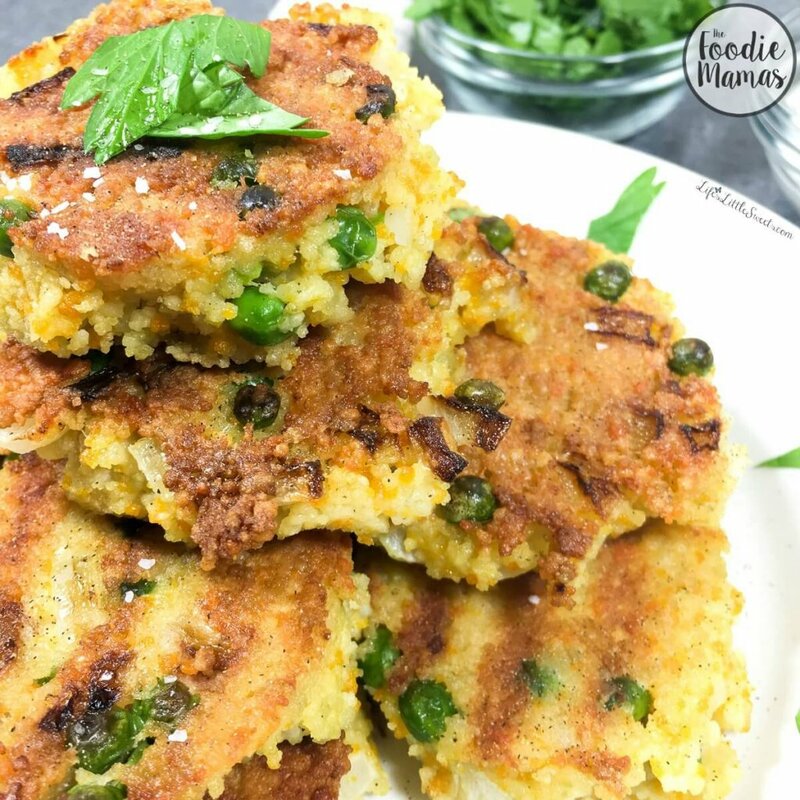 These couscous fritters are a great way to change up the typical way couscous is served. The amount in this recipe is perfect for 2-4 people and are a snap to make! 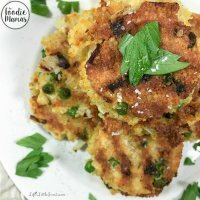 These crispy Couscous Fritters have only 7-8 ingredients and can be made in 30 minutes! 1-2 tablespoons of coconut oil, , plus more if needed (can sub for butter, olive oil or cooking oil of your choice). Make the Couscous: Bring water (or stock of choice) to a boil with salt, coconut oil and frozen organic peas. When mixture is boiling, add the couscous and remove from heat and cover. Allow to stand for 4-5 minutes to allow the moisture to absorb. Make the Fritters: In a medium bowl, add cooked couscous mixture, diced onion, eggs and mix until combined. Using 1/4 cup to scoop, form fritters and place on a plate. Have another plate ready for cooked fritters. Heat a large skillet (I use one that has grill marks) on medium-high heat with 1-2 tablespoons of coconut oil for frying. Once, skillet is preheated, cook fritters (I can fit 4-6 at a time in the skillet) for 4-5 mins on each side. I recommend covering while they are cooking to ensure they cook evenly through, I cover using a spatter guard, that allows some steam to escape. You can press down very slightly and gently, after you flip them over, then cook for another 4-5 minutes. They should be golden brown on each side. Reduce heat slightly, if necessary, to prevent burning. Add salt and pepper to taste. Serve and enjoy! This is my 4th #FoodieMamas recipe round up post (see 1, 2 & 3 here); what an amazing group ladies! 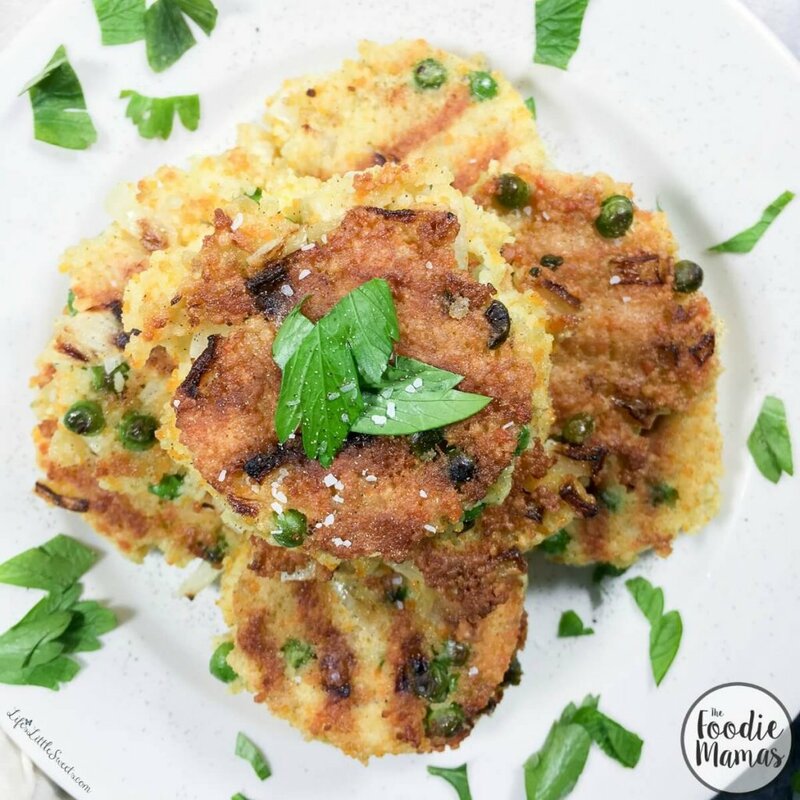 ⇒ I am delighted to share with you something *new* for this month, below is a pinnable image which you can also click on each picture and it will lead you right to the recipe on each #FoodieMamas website! Please take the time to check out each one and share! Thank you! What are your favorite couscous recipes? Let me know in the comments below! Really cool idea Sara – super creative…and I love the use of coconut oil. Super smart! Hi Deepika, I am so glad that you like them! These fritters look so delicious!! I never thought to use couscous in a fritter… genius! Hi Amanda, yeah, it was just another one of my food ideas knocking around my head, I am glad you like them, thank you for visiting! I love fritters! Although, I’ve never tried one with couscous. My favorite way to have couscous is as a salad with tomatoes, bell pepper, cucumber, avocado, feta, and chickpeas. It always makes me think of a garden in the summer time. Couscous is one of those ingredients that is so flexible, thank you for sharing how you like that have couscous Renee! I love this…they look great! 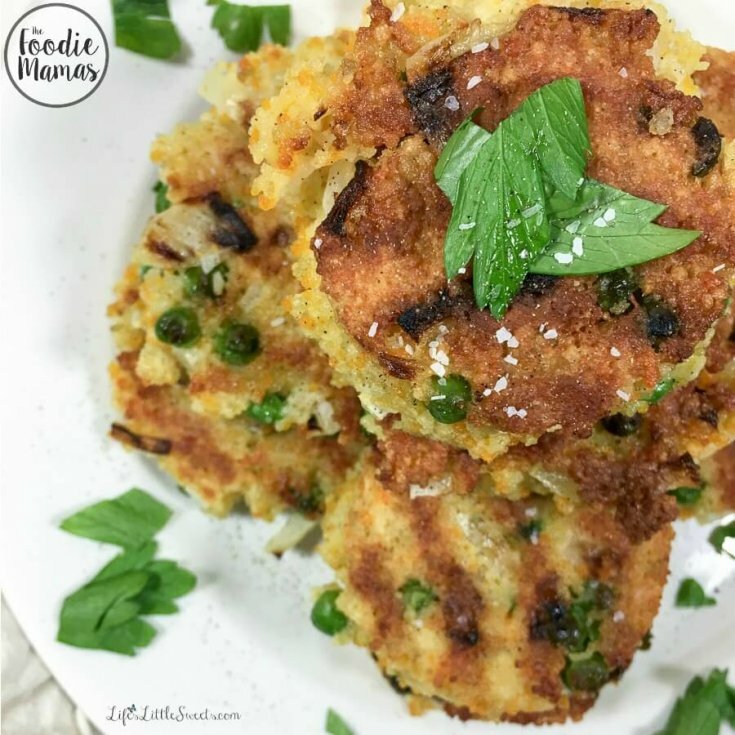 I love making veggie burgers/patties and these seem really simple! The kids would love these too. 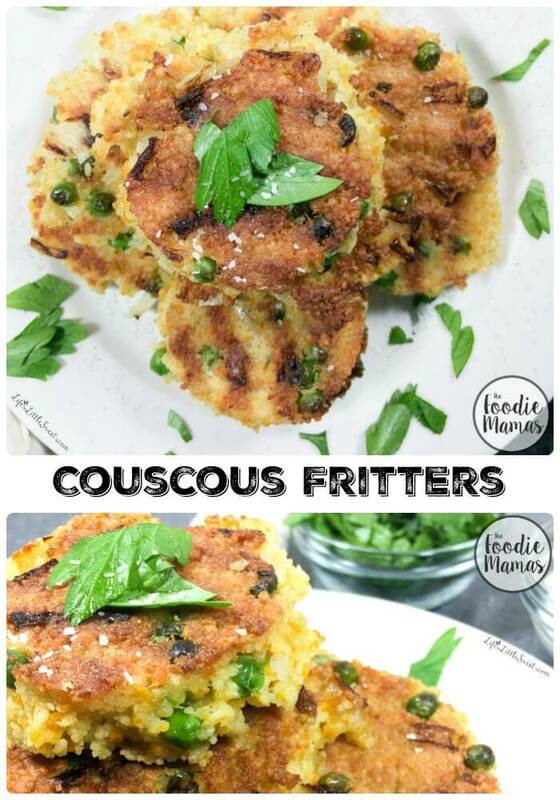 Your couscous fritters look FANTASTIC! I will be definitely trying these for lunch! Thanks for sharing! Hi Tania, I am so glad you like them, let me know how you like them! I haven’t made fritters in ages. Going to give these a go! 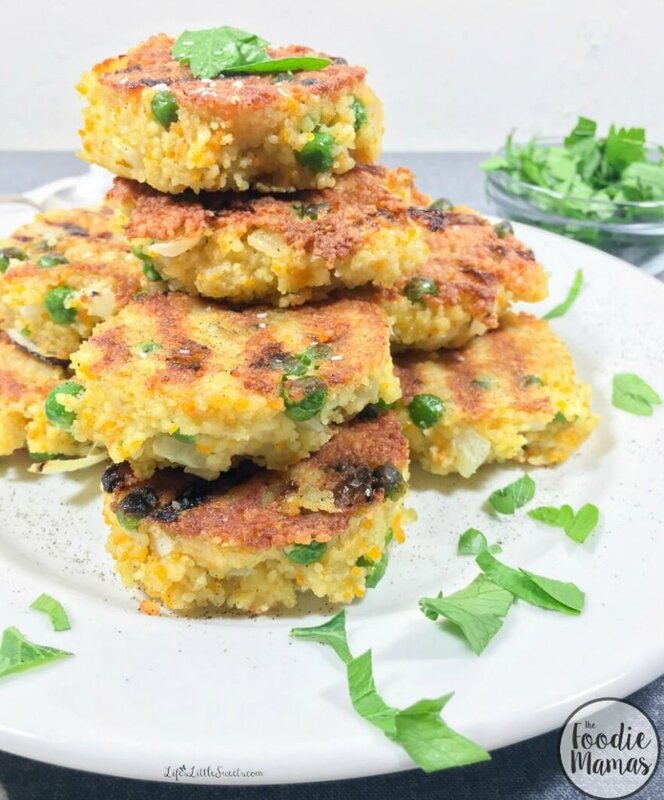 I don’t think I’ve ever had cous cous this way – these fritters sound absolutely delightful! I wanted to try couscous in a new way and this is what I came up with! Thank you for reading! It is SO simple and couscous is easier than making pasta! Thank you for visiting! Thank you Samantha! It’s such a great ingredient, I am glad that you like these!